LTHForum.com - Han 202 - Fantastic new restaurant in.......Bridgeport???? Han 202 - Fantastic new restaurant in.......Bridgeport???? LTH Home > Chat > Eating Out in Chicagoland > Han 202 - Fantastic new restaurant in.......Bridgeport???? Han 202 on 31st and Wallace just opened a week ago. Kind of Asian fusion if that's the proper term. I wish I knew more of the foodie lingo to describe but let me just say this place is beyond belief ! It puts most of the nearby Chinatown stalwarts to shame. The two comparisons that come to mind are Le Lan in Chicago and Wagamama in London. Except Han 202 was exponentially less expensive than either. This place has the best food, ambiance and service of just about anywhere I can recall in Chicago. We cant wait to go back. Right now, they're offering a 5 course tasting menu for $16 and you get multiple choices on each course !!!! Cant imagine price will last for too long. Just WAY too cheap for such quality. This would easily be $60 or more up on da nort side. -We were brought a huge amuse-bouche (girlfriend knew this word) of California roll which managed to restore my respect for the Americanized concoction. 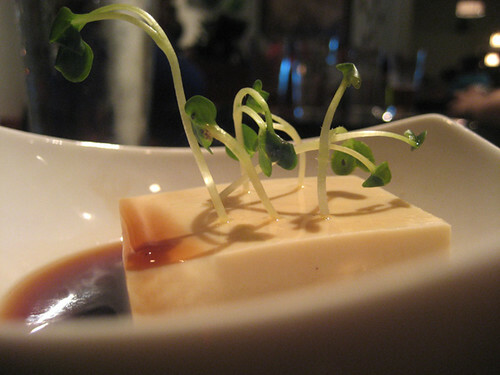 -Excellent miso with just the right saltiness. -Green apple salad It was shredded neatly and complimented by a delicate dressing that brought out the fresh crispness of the apples with... what is that?... capers?! -Tender, perfectly grilled beef mignon with vegetable bed and sauce. TOP QUALITY ingredients and attention to detail. No smushed mushroom or limp slice of zucchini to be found. Precision and selection was apparent everywhere. -Girlfriend had the halibut with bean sauce. It was a huge piece (6 oz? 8 oz?) of delicate, snowy white, tender fish, seared and served on a bed of beautifully stir-fried veggies with a thick, sweet/salty sauce. The veggies were SO good - mushroom, broccoli, asparagus, little sticks of maybe bamboo, etc. Rice served in a bowl on the side. -The coolest mochi desert presentation ever with green apple and drizzles and single nuts. After about 25 years of living on the north side I stumbled upon Bridgeport and moved here about 7 years ago. It never ceases to amaze me that the neighborhood remains basically unknown area to most of the city. In some ways I'm glad it stays that way. But please, tell all your friends, and come down to Han 202 and have some of the best new Asian ever....and then leave. We don't want this turning into a new Lincoln or Wicker Park or something and have our taxes go through the roof. Delurking to provide this bit of information: Han 202 is the new incarnation of Restaurant Guan (formerly Nine Fish Asian?) (http://lthforum.com/bb/viewtopic.php?f=14&t=11426&hilit=guan) in Evanston. I haven't been to Nine Fish Asian nor Restaurant Guan nor Han 202, nor am I affiliated with any of these. My coworker, however, was a frequent patron at Guan, and they became good friends with the owner, who contacted them once Han 202 opened (and the coworker then told me about the new opening). So, I don't know anything about the food, or quality, or value, or shilling, for that matter, but I thought I would add the Restaurant Guan component to the conversation. Very interesting, two blocks away from my place of livin'. I will do my best to stop in this weekend and report back! We visited Han 202 and reconnected with Guan and his wife. They remembered us as former Evanston customers. We remembered their fresh, exciting and exquisitely designed food. And if that wasn't worth the trip, his prices are half what they were in Evanston. 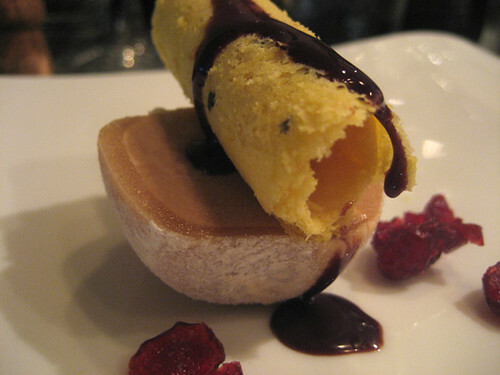 The menu is designed as a 5-course prix fixe for $20 with portions that are comparable to his old dishes!!! We were happy to see our old favorites, Red Curry Seafood and Lemon Grass Beef salad. In addition to fish, he also still has duck and chicken on the menu. Don't be put off by the location. It is only a 10-15 drive from River North. You can take Clark south to Archer, turn right to Canal, turn left and take Canal to 31st Street (one quick jog on Canal) and turn right (or if you must, take the Dan Ryan to Exit 54 merge onto Wentworth and turn right on 31st Street). They are open for lunch and dinner. It's actually Lowe, not Lake Park, just in case someone goes and is trying to find it by using street names. And I mentioned this place in the pre fixe thread, I agree this place is excellent. 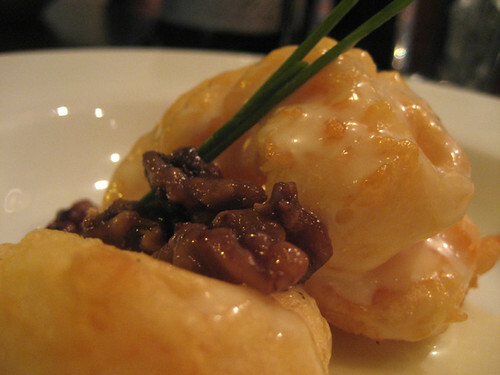 A "huge amuse bouche" is another American concoction. They're traditionally a bite size morsel, to show you the talent of the kitchen and tease you for what's to come. I'd call the California roll you got a free appetizer. First ecstatic post leads me to think... dare I say? My girlfriend reports that the sashimi box lunch special is an outstanding value. The fish was very fresh, reasonably priced, and generously portioned. The lunch special even includes miso soup and house salad. At 20 percent off, it's a pretty remarkable value. No idea re: the non-sushi lunch options, which appear to be sanitized pan-Asian (maybe I'm wrong about this). The prix fixe dinner, which I have had, is also a bargain. Some courses made more of an impression than others, but I would go back. Particularly strong: Miso soup, apple salad, lemongrass beef, lamb chops. It's worth adding that I live in the neighborhood, which is bereft of anything like this place. I believe that the storefront used to house an Italian restaurant, which was pricey and sort of mediocre. Han 202 is more original, less pricey, and better executed. I hope that people will give it a chance, as I'd like to see it stick around. That writer is an LTHer. MJN. I'm going to try Han 202 this Friday. Sounds interesting. I hope we give some credit to Redd who posted information on this board a while back. It was pretty solid information for a first post. Just noticed this place on Saturday, sitting in post-Sox traffic trying to get to parking for the soccer game. The place used to be Trattoria 31, I believe (could have the name wrong, but it was something very like that), a lousy upscale Italian joint. Hard to imagine it puts the places in Chinatown to shame, or even Ed's over on Halsted, but I will try it, perhaps as early as tonight on my way to a Sox game. Clearly working on a different style of food (upscale Asian fusion?). I suppose this makes sense given the continually growing Asian population of Bridgeport, though I have to wonder how well it will do. 31st Street has been tough on restaurants for years and years and years, unless they are cheap sandwich joints or lousy Mexican places. And I was definitely not aware Bridgeport was undiscovered. Two GNRs, the real Chicago baseball team ( ), center of Chicago political power for the last 60 years, and lots more. Including the wackiest modern bungalows I have found. Thanks for the info. Will try it out and report back. That's alright. I hear ya. I'm not easily moved by most (food) writers either. Dickson - Han 202 is not authentic in anyway really. It is the most messed up melange of pan-asian you can imagine, the kind of thing some would generally scorn for its lack of purism. That being said, what's undeniable is the chef here understands balance of flavor and cooking things properly as much as anyone. He just doesn't have any hang-ups about cooking General Tsao's chicken at the same time as mixing thyme, tomato sorbet, and vanilla ice cream, or mixing granny smith apple salad with lemongrass beef. I actually am one of those who normally avoids Pan-Asian, not so much because I object to the lack of purity, but rather because it seems to be a minefield in which many lesser lights have gone up in flames (now there is a melange, metaphorically speaking). I understand in principle that if you want to be really creative, you will miss at times, but my experience with most Pan-Asian places is that they either quickly settle in to making mediocre versions of standards from many countries (see Joy Yee Noodles), or frenetic concoctions with no balance and even less restraint (Urban Belly is one exemplar, though I know I am in a small minority in feeling this way). Anyway, it seems to be very hard to do even passably well, based on my experiences. Still I will try Han since those I respect believe this guy is up to the challenge. And because I eat in Bridgeport regularly. My companions wanted Italian, so we went to Gio's instead. Actually pretty decent that night, as was the baseball. See the green slice on the amuse I had tonight at Han 202? It turned up again on my tuna. The five course meal at Han 202 costs an amazingly low $20 per person (plus whatever you BYOB), and at the end of it, a summit of the foodwriting intelligentsia was discussing how much we would be willing to pay for it and what we would think of it at different prices. At $28 (currently the magic price point for many restaurant entrees, since it's just shy of breaking the $3X barrier), it would seem fairly priced. At $35 or $40, we might start to become critical about which parts of the meal were on and which were off: some things were really well balanced in their flavors, others were almost candy sweet; some were exquisitely plated, some seemed kind of like ordinary Chinese food. All of which is to say, this may be an arty five course meal, but it isn't Alinea, or even Schwa, in its level of accomplishment (or caliber of ingredients). Still, at the insanely low $20 or even a perfectly reasonable $30, this is a meal which delivers an impressive amount of fine dining experience for the bucks, in an atmosphere which feels hip and nice but is still pretty casual. If you're a twentysomething guy looking for a nice place to take a hot date and feel like you took her somewhere fancy which you can't really afford, there's probably no better choice for you in town at the moment. The meal started with an amuse-bouche of mushroom topped with a styrofoam-crunchy radish-like vegetable (which the waitress said was called bacha, though so far I've been unable to find any vegetable with a name like that). The textural contrast and presentation were a fitting statement of intent for the meal to follow— mainly, that this isn't going to be the usual throw it all together in a wok delivery Chinese; that some of the precision and delicacy of Japanese food is coming. 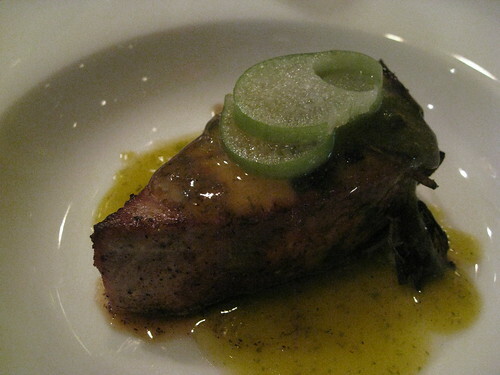 Another that impressed me was a substantial chunk of seared tuna with a lime accent to the soy-or-whatever sauce it was sitting in. Mine was a level down from that— they called it walnut shrimp, after tasting its unsubtle blast of orange extract I dubbed it "Shrimp in Tang sauce"— but like the mayonnaise shrimp at Lao Sze Chuan, it was oddly likable in a white trash kind of way. The main course that followed seemed pedestrian by comparison, like conventional Chinese food, different meats all cooked the same way in a wok, with the same vegetables out of the big foodservice bag of broccoli/green and red pepper/baby corn. It was pretty good Chinese, the sauces were bright and light, little grease, but hey, I could say the same about P.F. Chang's, basically. All in all this course seemed the least novel, the least paradigm-shattering, and the one dish that was different from the others, a small rack of lamb, was prepared well but marred by a gloppy-sweet sauce. Dessert, apparently, was winged out of commercial mochi and Italian cookies when they ran out of other stuff, my expectations for dessert in an Asian restaurant are always low and this... definitely beat a stale almond cookie. The dried cherries at least demonstrated that they thought about it for more than two seconds. I'd love someday to see someone open a truly deluxe Chinese restaurant, like you hear they have in places like Vancouver, but until that happens, I'm happy to have a Chinese restaurant run by people who seem aware of things happening in the broader food scene and ambitious enough to try to offer a fine dining-like experience at barely above cheeseburger prices. The price surely can't last and the BYOB may be temporary too (there is a bar, left over from the previous Italian inhabitant according to Chuck Sudo of Chicagoist), so Han 202 is definitely one to try sooner, rather than later. Like our new Indonesian entrant, with enough support it might be the harbinger of even more interesting and accomplished things to come. Check out Michael Nagrant's rave, which put Han 202 on the foodie radar, and Mike Sula adds some details in this week's Reader, even though they totally missed the chance to make a Han Sula pun in the headline. David Hammond wrote: Know what it is? Isn't that bac ha, sometimes (confusingly) called taro stem? Here's some bac ha in a Vietnamese soup I had in Los Angeles (the full post can be found here). I've seen the raw stems for sale in Chicago, at H Mart for example. And here is a link to a blog that has a nice picture of a package of bac ha from the market. Aha! For lack of a space Google was helpless to help us, but that's clearly it. No flavor that we discerned, but definitely interesting crunch, the water chestnut of the new millennium. I tried Han 202 last night with my step mother and had a really lovely dinner. Ten minutes from the Loop and easy street parking are big pluses. Most, but not all, tables occupied on a Monday night. We didn't have a reservation. The only option they're currently offering is five courses for $20 (If you look at their online menu, it appears that a la carte is available). For the first course, we both went with the spicy king crab miso soup. It was spicier than I'd expected, but didn't have much depth. 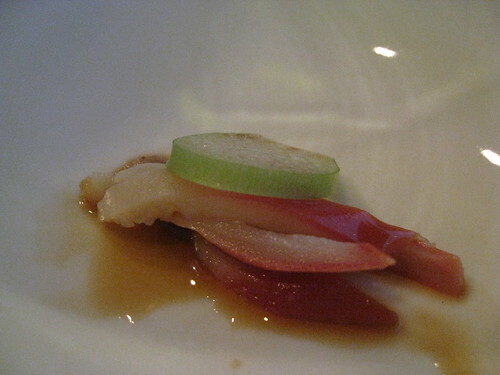 A piece of crab was hovering along the bottom, saturated with the spicy miso broth. I think another type of seafood that would be less likely to fall apart, such as shrimp or mussels, would've worked much better. Next, I went with the beef lemongrass salad, which was both strange and satisfying. 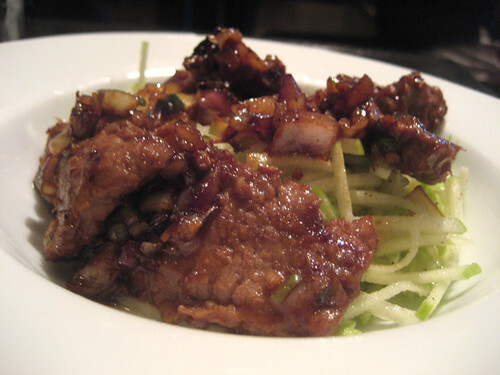 The beef was tender and flavorful, and sat on a bed of julienned green apples. At first, I couldn't figure out what the unusual flavor was - - then I spotted the capers. It was an odd combination, but somehow worked and was refreshing. This wasn't a home run, but it was good and I'd order it again. My step mom ordered the cucumber crab meat salad. I had a small bite. This was a lightly dressed salad, typical for a low end Japanese restaurant, and not at all memorable. A pass, I think. For appetizers, I ordered the salt & pepper calamari. 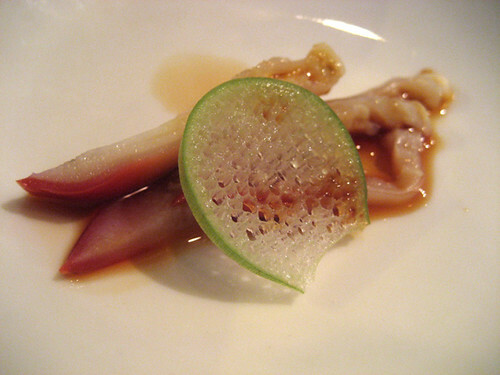 The calamari were cut into three-inch long thin strips, lightly floured, and deep fried. They were tossed with green bell peppers. This dish was fine. I'd try something else instead, next time. Step mom had the shrimp gyoza. The skin was impressively delicate. But, the filling was bland. The three gyoza sat in a bowl over a strange, sweet soy dipping sauce. I forgot to ask what was in the sauce. We both ordered fish dishes for our main courses. They were both big winners. I ordered the halibut with shacha sauce. A nice piece of properly cooked fish with green bells, red onions, zucchini, and asparagus. Slightly sticky, sweet sauce. I'd get this again. Step mom had the grouper with julienned ginger and scallion soy sauce, a much more delicate, but equally delicious plate. Dessert was forgettable. Some kind of icy mango gelato with a too cold cherry. The highlight was the fresh longan. So, as is apparent from my review, this restaurant isn't amazing. But, it was an adequate amount of food, and at $20 for five courses, a great value. I'd say that the food is much lighter than what you'd find in most Chinese restaurants, almost approaching Japanese cooking in its sensibility. Most dishes were prepared simply with a few fresh ingredients. If you're super-hungry, go elsewhere (or plan to hit Scoops across the street for a second dessert). If you'd like a relaxed, lovely meal, Han 202 is a good choice. BYOB is a plus, too. I also think that Han 202 is a great option for larger parties where folks are splitting the bill. Everyone knows what the cost is going to be going in, and there's no stress of handling the bill when someone orders a salad while someone else has four courses and drinks. We've been back to Han 202 a couple of times since last Spring. It continues to be a delight, with a pleasant ambiance and quietly professional service. Amazingly enough, the $20 fixed-price menu and BYOB status have remained intact, making the 5-course dinners there one of the best dining bargains in the Chicago area. The food continues to be top-notch: most of the menu items remain from one visit to the next, but there are always a few updates, so it is hard to fall into a rut there. As always, the skill of chef Guan Chen is impressive in the taste and presentation of the food, particularly with fish and seafood. Sadly, their business has been quite slow during the week for some time, and Chen's wife (who hosts and waits tables) hinted that they were struggling a bit despite better turnouts on the weekend. The upcoming baseball season will probably make matters worse as traffic will make the neighborhood near the restaurant less desirable when the Sox are playing at home. The restaurant is only a 10-15 minute drive from the Loop (take Clark-Archer-Clinton, not LSD), and there is plenty of street parking (when the Sox are not playing). It was sad when Guan left Evanston and there was a hiatus until Han 202 opened. I hope that history will not repeat itself (or worse). Has anyone visited Han 202 recently? I was thinking of making a first visit while I'm in Bridgeport for the opening of Maria's Community Bar this Friday. It was great when I went approx. a year ago for the prix fixe. Please go, if only to keep this gem in business. Not everything is perfect, but the value is great and it's really good at best, and very interesting at the least. mtgl wrote: It was great when I went approx. a year ago for the prix fixe. Please go, if only to keep this gem in business. Not everything is perfect, but the value is great and it's really good at best, and very interesting at the least. ditto. Wish I could say more but mtgl said it perfectly. Don't miss the miso w/crab soup, the salad w/apples and truffle oil and the duck main. And thanks for jogging my memory about this place--I need to plan a return trip! happy_stomach wrote: Has anyone visited Han 202 recently? I was thinking of making a first visit while I'm in Bridgeport for the opening of Maria's Community Bar this Friday. I haven't been to Han 202 but can't stop myself from making a few comments about Maria's. This old bar and package goods store, also known as Kaplan's Liquors, was one of Chicago's oddest and greatest dive bars. I loved the place but never felt quite comfortable drinking there. A big part of the reason was the world-class collection of ventriloquist's dummies gazing down from their perches high above the bar. Those are gone, and Bridgeport loses more of its character. Next thing you know, Ramova Grill will unveil their new all-panini menu. I hope the new Community Bar will be a great place but I'm not sure I'll ever find out. Rene G wrote: A big part of the reason was the world-class collection of ventriloquist's dummies gazing down from their perches high above the bar. Those are gone, and Bridgeport loses more of its character. Next thing you know, Ramova Grill will unveil their new all-panini menu. I hope the new Community Bar will be a great place but I'm not sure I'll ever find out. Stopped for a drink at the new Maria's Community Bar , think I would have liked it better with the puppets. Crowd was the dungeons and dragons type pretending they were tech guys for bands and indie films. Did run into Art Jackson, Urban Forager and chef at Bijan’s Bistro, who is a pretty cool guy, so I guess it's not all DD and World of Warcraft at Maria's. I went to Han 202 last night and didn't come away terribly impressed. The menu is up to $25 per person, with several items on the menu adding supplements. I started with the spicy miso soup with snow crab. Not much more to say about this other than the miso soup was in fact spicy and it had a single bite of snow crab. Next I had the arugula and parmesan salad, which was crunchy from the overabundance of salt crystals that were used to dress the salad. For my appetizer I had the Shanghai dumplings. The wrappers were too thick, and the inside was a dried out pork meatball. My main course was probably the high point of the meal. I had the duck in spicy szechuan sauce. The duck was cooked a bit past my requested medium rare but was certainly tender and juicy. The sauce packed a nice punch and the plate had some lovely crisp vegetables (although it also had squares of pineapple). Dessert was mango sorbet...also nothing special. Overall I was expecting the meal to be a bit more "high end". I don't mean that in terms of ingredients because for $20 or $25 what can you really expect. I mean that I was expecting to get something beyond what I could get just up the road in Chinatown. Something more refined, or more creative. This just seemed like a way to for people to eat Chinese food if they're too intimidated to walk into a more authentic Chinese restaurant. I was saying after dinner that I could easily put together a much more enjoyable, and more interesting meal, at either Lao Sze Chuan or Sun Wah for the same price (you just wouldn't get to sit in Han's fancy chairs). Went to Han 202 this past Friday based solely on the bib gourmands that just came out. Bit of a treck south but extremely impressed. This was a really nice place (décor, table ware etc. ), which I was not expecting. The food was outstanding as was the service. The price point and BYO all make this a really really good spot. Amuse was a sort of custard cup that was strangely sweet for an amuse but was good. First course I had the lobster with beets which was really good, not a highlight but solid flavors. Second course I had the salt and pepper calamari with diced red and green pepper, this was great perfectly done, for my main I had General Tso's chicken which was also spot on. Dessert I had the chocolate soufflé, not a molten lava cake but an actual soufflé which I am a sucker for and rarely see anymore. Couldn't have been more surprised by the food. I am eager to return again.